Not to be confused with Rudolf Hess. Rudolf Franz Ferdinand Höss (also spelled Höß, Hoeß, or Hoess) (25 November 1900 – 16 April 1947) was a high-ranking member of the Nazi Schutzstaffel (SS) during World War II. He was in charge of Auschwitz concentration camp for about four years. During World War II, Nazi Germany, led by Adolf Hitler, decided to exterminate (kill all of) the Jewish people in Europe. They called this plan the "Final Solution". The Nazis also sent many other people to concentration camps and extermination camps (death camps). As Commandant (commander) at Auschwitz, Höss tested and started using different ways of killing these people more quickly. He started using Zyklon B, a pesticide with hydrogen cyanide in it, to kill prisoners in gas chambers. This allowed Nazi soldiers at Auschwitz to murder 2,000 people every hour. At Auschwitz, he created the largest place meant for the constant mass murder of human beings ever known in history. Höss joined the Nazi Party in 1922, and joined the SS in 1934. From 4 May 1940 to November 1943, and again from 8 May 1944 to 18 January 1945, he was in charge of Auschwitz. Before Nazi Germany lost World War II, more than a million people were murdered at Auschwitz. Höss was hanged in 1947 after he was found guilty at a trial in Warsaw, Poland. Höss was born in Baden-Baden, Germany, on 25 November 1900. His parents were Franz Xaver Höss and Lina Höss. He was the oldest of three children, and was the only son. Höss's family was very Catholic. In his autobiography, Höss said that he was briefly kidnapped by Gypsies when he was a child. Höss's father was a former German army officer who had served in German East Africa (a German colony that included what are now Burundi, Rwanda, and part of Tanzania). After leaving the army, he ran a tea and coffee business. He brought up his son based on strict Catholic beliefs, and with military discipline. He had decided that Höss would become a Catholic priest. During Höss's early childhood, he was constantly being told about sin, guilt, and the need to do penance. Höss began turning against religion as a young teenager. This happened after he gave a confession to a priest (he told the priest what he had done wrong). In Catholicism, the "Seal of the Confessional" is supposed to be unbreakable. This means a priest is never supposed to tell anyone what someone has said in a confession. Höss said he started to dislike religion when the priest told Höss's father about something Höss had said in a confession. Soon after this, Höss's father died, and Höss began moving toward a military life. When World War I started, Höss served briefly in a military hospital. Then, at age 14, he was allowed to join his father's and grandfather's old regiment, the German Army's 21st Regiment of Dragoons. At age 15, he fought with the Ottoman Sixth Army at Baghdad, at Kut-el-Amara, and in Palestine. While stationed in Turkey, he rose to the rank of Feldwebel (sergeant). At age 17, he was the youngest non-commissioned officer in the German Army. While in the Army, he was injured three times and got malaria. He was awarded the Ottoman Empire's Gallipoli Star, the Iron Cross first and second class, and other decorations. After Germany surrendered in November 1918, Höss finished high school. Soon, he joined the nationalist paramilitary groups that were forming. First, he joined the East Prussian Volunteer Corps. Then he joined the Freikorps Rossbach in the countries around the Baltic Sea, Silesia, and the Ruhr. Höss participated in the armed terror attacks on Polish people during the Silesian Uprisings (when the Polish people tried to break away from German control). He also participated in terror attacks on French nationals during the Occupation of the Ruhr (when the Ruhr valley in Germany was occupied by France and Belgium). Höss joined the Nazi Party in 1922 after hearing Adolf Hitler's speech in Munich. Höss led at least one political assassination, and spent six years in jail for it. On 31 May 1923, in Mecklenburg, Germany, Höss and members of the Freikorps (German volunteer soldiers) beat to death a local schoolteacher named Walther Kadow. They did this because Martin Bormann wanted them to. Bormann later became Hitler's private secretary. Bormann thought that Kadow had told the French occupational government Nazi soldier Albert Leo Schlageter was sabotaging French supply lines. Schlageter was arrested and executed on 26 May 1923. Soon afterward, Höss and several accomplices, including Bormann, killed Kadow out of revenge. In 1923, after one of the killers confessed to a local newspaper, Höss was arrested and tried as the leader of the murder. Höss later said than another man was actually in charge, but at the time, Höss accepted the blame as the group's leader. He was convicted and sentenced (on 15 or 17 May 1924). His sentence was for 10 years in Brandenburg Penitentiary (prison). Bormann was sentenced to one year in prison. Höss was released in July 1928 as part of a general amnesty. He joined the Völkisch movement ("Artaman League"), a nationalist "back-to-the-land" movement that supported clean, farm living. On 17 August 1929, Höss married Hedwig Hensel (3 March 1908 – 1989), whom he met in the Artaman League. Between 1930 and 1943, they had five children: two sons (Klaus and Hans-Rudolf) and three daughters (Ingebrigitt, Heidetraut, and Annegret). Höss became a member of the SS on 1 April 1934, when Heinrich Himmler encouraged all Nazi men to join the SS. Höss joined the SS-Totenkopfverbände (Death's Head Units) in the same year. He came to admire Himmler so much that he thought whatever Himmler said was "gospel." He even preferred to display Himmler's picture in his office instead of Hitler's. Höss was assigned to the Dachau concentration camp in December 1934. There, he where he held the post of Blockführer ("Block Leader"), meaning he was in charge of one barracks of prisoners. In 1938, Höss was promoted to SS-Hauptsturmführer (Captain), and was made an assistant to Hermann Baranowski in the Sachsenhausen concentration camp. Höss joined the Waffen-SS in 1939 after Nazi Germany invaded Poland. Höss was good at his job, and his bosses suggested that he should be promoted (given a better job). By the end of his tour of duty there, Höss was in charge of prisoners' belongings. On 1 May 1940, Höss was appointed commandant of Auschwitz, which was a combination of concentration camps and an extermination camp. Höss commanded the camp for three and a half years. During this time, he changed the original camp into a huge complex (group of camps) called Auschwitz-Birkenau. Höss went to Auschwitz determined "to do things differently" and develop a more efficient camp than the camps at Dachau and Sachsenhausen where he had worked before. Höss lived at Auschwitz in a villa with his wife and five children. The earliest inmates at Auschwitz were Soviet prisoners of war and Polish prisoners, including peasants and intellectuals. About 700 of these prisoners arrived at Auschwitz in June 1940; the Nazi guards told them they would not survive more than 3 months. There were also many smaller "sub-camps" nearby. The Auschwitz complex was built on about 8,000 hectares (20,000 acres) that had been cleared of everyone who lived there. In June 1941, Höss met with SS Commander Heinrich Himmler in Berlin. Himmler told Höss that Hitler had given the order for the Final Solution - to kill all of the Jewish people. Himmler had chosen Auschwitz as the place where Europe's Jews would be exterminated. He chose Auschwitz "[because] of its easy access by rail [train] and also because the extensive site offered space for measures ensuring isolation." This meant that Auschwitz was big enough that the genocide of the Jews could be kept secret. Himmler described the project as a "secret Reich matter." Höss later said that "no one was allowed to speak about these matters with any person and that everyone promised upon his life to keep the utmost secrecy." Höss began testing and perfecting mass murder techniques on 3 September 1941. His experiments made Auschwitz the camp that would kill the most prisoners during the Holocaust. Höss later said that, during a regular day at Auschwitz, two to three trains carrying 2,000 prisoners each would arrive every day for periods of four to six weeks. 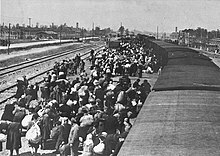 The prisoners were unloaded in the Birkenau death camp. Prisoners who were strong, healthy, and able to work were marched to barracks in either Birkenau or one of the other Auschwitz camps. Prisoners who were elderly, very young, sick, or unable to do forced labor were killed in gas chambers, which were disguised as showers. At first, small gassing bunkers were located deep in the woods, to keep them secret. Later, four large gas chambers and crematoria were built in Birkenau to make it easier for the Nazis to kill more people, more quickly. Technically [it] wasn't so hard—it would not have been hard to exterminate even greater numbers.... The killing itself took the least time. You could dispose of 2,000 [people] in half an hour, but it was the burning that took all the time. The killing was easy; you didn't even need guards to drive them into the chambers; they just went in expecting to take showers and, instead of water, we turned on poison gas. The whole thing went very quickly. Höss experimented with different poison gases. At first, he used cotton filters soaked in sulfuric acid. Höss later started using hydrogen cyanide (prussic acid), made from the pesticide Zyklon B, after his deputy Karl Fritzsch tested it on a group of Russian prisoners in 1941. Höss said that when he used Zyklon B, it took 3–15 minutes for prisoners to die, and that "we knew when the people were dead because they stopped screaming." On 10 November 1943, Arthur Liebehenschel became the Commandant at Auschwitz. Höss took over Liebehenschel's last job as the chairman of Amt D I in Amtsgruppe D of the SS-Wirtschafts-Verwaltungshauptamt (WVHA), which ran the concentration camps. Höss also was made the deputy (assistant) of Richard Glücks, the inspector of all of the concentration camps. On 8 May 1944, Höss returned to Auschwitz to supervise operation Aktion Höss. In Aktion Höss, 430,000 Hungarian Jews were sent to Auschwitz and killed in 56 days. Even the huge facility that Höss had built could not handle the huge number of victims' corpses. The camp's staff had to burn thousands of bodies in open fire pits. In the last days of the war, Himmler told Höss to disguise himself among German Navy sailors. Höss avoided arrest for nearly a year. When he was captured by British soldiers on 11 March 1946 in Gottrupel, he was disguised as a gardener and called himself Franz Lang. 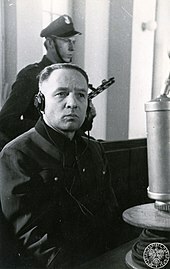 His wife, who feared that her son, Klaus, would be shipped off to the Soviet Union to be imprisoned or tortured, had told the British where Höss was. The British soldiers that captured Höss were led by Hanns Alexander, a young Jewish man from Berlin who was forced to flee to England with his entire family during the rise of Nazi Germany. Höss initially denied who he was, until Alexander noticed his wedding ring and demanded to see it. Höss refused to remove it, saying it was stuck on his finger. But when Alexander threatened to cut his finger off, Höss removed the ring. It had the names "Rudolf" and "Hedwig" engraved inside. After being questioned and beaten with axe handles by the British soldiers, Höss admitted who he really was. Höss appeared at the Nuremberg Trials on 15 April 1946, where he explained his crimes in detail. Affidavits (sworn statements to the court) that Rudolf Höss made while imprisoned in Nuremberg were also used at the Pohl and IG Farben trials. I commanded Auschwitz until 1 December 1943, and estimate that at least 2,500,000 victims were executed and exterminated there by gassing and burning, and at least another half million succumbed to starvation and disease, making a total of about 3,000,000 dead. This figure represents about 70% or 80% of all persons sent to Auschwitz as prisoners, the remainder having been selected and used for slave labor in the concentration camp industries. Included among the executed and burnt were approximately 20,000 Russian prisoners of war (previously screened out of Prisoner of War cages by the Gestapo) who were delivered at Auschwitz in Wehrmacht transports operated by regular Wehrmacht officers and men. The [rest] of the total number of victims included about 100,000 German Jews, and great numbers of citizens (mostly Jewish) from Holland, France, Belgium, Poland, Hungary, Czechoslovakia, Greece, or other countries. We executed about 400,000 Hungarian Jews alone at Auschwitz in the summer of 1944. This is where the camp Gestapo was located. Prisoners suspected of involvement in the camp's underground resistance movement or of preparing to escape were interrogated here. Many prisoners died as a result of being beaten or tortured. The first commandant of Auschwitz, SS-Obersturmbannführer Rudolf Höss, who was tried and sentenced to death after the war by the Polish Supreme National Tribunal, was hanged here on 16 April 1947. Höss wrote his autobiography while awaiting execution. It was published in 1956 as Kommandant in Auschwitz; autobiographische Aufzeichnungen, and later as Death Dealer: the Memoirs of the SS Kommandant at Auschwitz (among other editions). In all of the discussions, Höss is quite matter-of-fact and apathetic, shows some belated interest in the enormity of his crime, but gives the impression that it never would have occurred to him if somebody hadn't asked him. There is too much apathy to leave any suggestion of remorse and even the prospect of hanging does not unduly stress him. One gets the general impression of a man who is intellectually normal, but with the schizoid apathy, insensitivity and lack of empathy that could hardly be more extreme in a frank psychotic. My conscience compels me to make the following declaration. In the solitude of my prison cell I have come to the bitter recognition that I have sinned gravely against humanity. As Commandant of Auschwitz I was responsible for carrying out part of the cruel plans of the 'Third Reich' for human destruction. In so doing I have inflicted terrible wounds on humanity. I caused unspeakable suffering for the Polish people in particular. I am to pay for this with my life. May the Lord God forgive one day what I have done. Shortly before his execution, Höss returned to the Catholic Church. On 10 April 1947, he received the sacrament of penance from Friar Władysław Lohn, S.J. On the next day, the same priest gave Höss Holy Communion as Viaticum (the Eucharist given to a person who is dying). Höss's original confession, with his signature, is displayed in a glass case in the United States Holocaust Memorial Museum in Washington, D.C. Behind the confession is a photo showing Hungarian Jewish women and children walking to one of the four gas chambers in the Birkenau death camp on 26 May 1944. ↑ Harding, Thomas (September 2013). Hanns and Rudolf: The True Story of the German Jew Who Tracked Down and Caught the Kommandant of Auschwitz. Simon & Schuster. p. 288. ISBN 978-0-434-02236-6 – via Google Book, preview. Author's Note to Chapter One. ↑ 2.0 2.1 Levy, Richard S. (2005). Antisemitism: A Historical Encyclopedia of Prejudice and Persecution (Two Vol. Set). ABC-CLIO. p. 324. ISBN 1-85109-439-3. ↑ Commandant of Auschwitz (2000), Appendix 1, p. 193. ↑ Piper, Franciszek & Meyer, Fritjof. Overall analysis of the original sources and findings on deportation to Auschwitz. Review of article "Die Zahl der Opfer von Auschwitz. Neue Erkentnisse durch neue Archivfunde", Osteuropa, 52, Jg., 5/2002, pp. 631–641. ↑ Michael Phayer (2000), The Catholic Church and the Holocaust: 1930-1965 Indiana University Press, ISBN 0253214718; p. 111. ↑ 7.0 7.1 7.2 Höss, Rudolph ; edited by Steven Paskuly ; translated by Andrew Pollinger ; foreword by Primo Levi (1996). Death dealer : the memoirs of the SS Kommandant at Auschwitz (Google Books) (1st Da Capo Press ed.). New York: Da Capo Press. p. 52. ISBN 0-306-80698-3. ↑ 9.0 9.1 Shira Schoenberg (1990). "Martin Bormann". Retrieved 5 August 2011. ↑ Rudolf Höss (1958). Kommandant in Auschwitz. Deutsche Verlags-Anstalt. p. 37. ↑ Ludwig Pflücker, Jochanan Shelliem (2006). IAls Gefängnisarzt im Nürnberger Prozess: das Tagebuch des Dr. Ludwig Pflücker. Indianopolis: Jonas. p. 135. ISBN 3-89445-374-5. ↑ Rudolf Höss (1960). Commandant of Auschwitz: autobiography. World Pub. Co. p. 37. ↑ Paul R. Bartrop (2014). "Rudolf Hoess". Encountering Genocide: Personal Accounts from Victims, Perpetrators, and Witnesses. ABC-CLIO. p. 111. ISBN 1610693310. Retrieved 27 February 2015. ↑ 17.0 17.1 Hughes, John Jay (25 March 1998). A Mass Murderer Repents: The Case of Rudolf Hoess, Commandant of Auschwitz. Archbishop Gerety Lecture at Seton Hall University. PDF file, direct download. ↑ BBC History of World War II. Auschwitz; Inside the Nazi State. ↑ "Jozef Paczynski, holocaust survivor - obituary". Daily Telegraph. 5 May 2015. Retrieved 6 May 2015. ↑ Pressac, Jean-Claude (1989). AUSCHWITZ: Technique and Operation of the Gas Chambers p. 132. First experimental gassing in Block 11. ↑ Commandant of Auschwitz (2000), pp. 106–157, and Appendix 1, pp. 183–200. ↑ Gilbert (1995), pp. 249–50. ↑ Commandant of Auschwitz (2000), p. 146. ↑ Wilkinson, Alec, "Picturing Auschwitz", The New Yorker, 17 March 2008, pp. 50–54. ↑ 27.0 27.1 27.2 "Nazi hunter: Exploring the power of secrecy and silence". The Globe and Mail. 7 November 2013. Retrieved 14 April 2014. ↑ "Hiding in N. Virginia, a daughter of Auschwitz by Thomas Harding". washington post. 7 September 2013. Retrieved 8 February 2015. ↑ "Hanns and Rudolf by Thomas Harding, review". The Telegraph. 9 September 2013. Retrieved 14 April 2014. ↑ Kevin Jon Heller. The Nuremberg Military Tribunals and the Origins of International Criminal Law. Oxford University Press. 2011. p.149. ↑ Applebome, Peter (14 March 2007). "Veteran of the Nuremberg Trials Can't Forget Dialogue With Infamy". The New York Times. Retrieved 15 March 2007. ↑ Höss, Rudolf (15 February 2019). "Kommandant in Auschwitz; autobiographische Aufzeichnungen". Deutsche Verlags-Anstalt – via Open WorldCat. Autobiography, edited by Steven Paskuly and translated by Andrew Pollinger: Death Dealer: The Memoirs of the SS Kommandant at Auschwitz. Buffalo, N.Y.: Prometheus Books, 1992. ISBN 978-0-87975-714-4. Google Books preview. Gilbert, Gustave. 1995. Nuremberg Diary. USA: Da Capo Press. ISBN 978-0-306-80661-2. SS Personnel Service Record of Rudolf Höss, National Archives and Records Administration, College Park, Maryland, US. Harding, Thomas (September 2013). Hanns and Rudolf: The True Story of the German Jew Who Tracked Down and Caught the Kommandant of Auschwitz. Simon & Schuster. ISBN 978-0-434-02236-6. Fest, Joachim C. and Bullock, Michael (trans.) "Rudolf Höss - The Man in the Crowd" in The Face of the Third Reich New York: Penguin, 1979 (orig. published in German in 1963), pp. 415–432. ISBN 978-0201407143. Wikimedia Commons has media related to Rudolf Höß. "Rudolf Höss". World War II Holocaust Criminal. Find a Grave. 7 February 2005.